What Is DA Form 647? DA Form 647, Personnel Register is a source document for the Electronic Military Personnel Office (eMILPO) which is used for documenting personnel movements within units when performing a permanent change of the station (PCS) or carrying out temporary duty. The register is also used to record leaves, passes or visitors. Commanders should establish procedures to maintain the DA 647 and will designate a place where the form will be held during and after duty hours. The latest version of the form - sometimes incorrectly referred to as the DD Form 647 - was released by the Department of the Army (DA) in June 2010. An up-to-date DA Form 647 fillable version is available for download and digital filing below or can be found through the Army Publishing Directorate website. The personnel register is unclassified and approved for public release, but may not be released to foreigners. All foreigners must use the DA Form 647-1, Personnel Register, released in April 2010. How To Fill Out Da Form 647? For use of this form, see AR 600-8-6; the proponent agency is DCS, G-1. The form should be used until all spaces are filled. All entries should be printed or typed with black ink. Personnel signing in or out should personally certify the form with their signature unless commanders designate a representative to sign for the person, in which case the name and title of the representative have to be specified in the remarks box. The top boxes of the form require the name of the organization that uses the DA 647 and the correct date. The first column - Column 1 - is for the date and time of each duty status change. The first entry should indicate the first date when the form was used. Columns 2 and 3 - Action - should specify the kind of movement being performed - either arrival or departure. The next blocks - Columns 4 through 7 - are used for providing a reason for the relocation (permanent change of the station, temporary duty, or other). Soldiers who depart on transition leave should check the PCS block and specify the number of days of leave in the remarks box. Column 8 requires the name of the service member and their signature for every entry in Column 1. 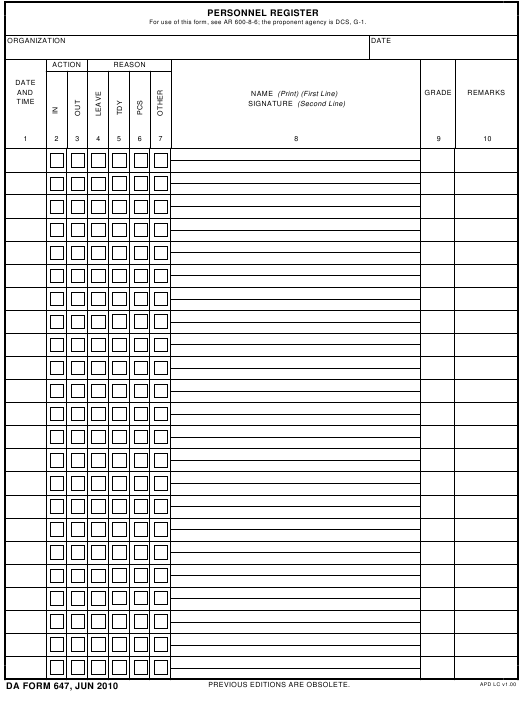 Column 9 is for specifying the grade of the service member signing the form in Column 8. All service members signing in or out have to personally sign the register. If this cannot be done, commanders are allowed to designate a representative to accept reports and sign the form for that person. The name and title of that representative have to be specified in the remarks box for every entry. If there is a change of command or if the commander is lost due to death, DA Form 3986, Personnel Asset Inventory will be used to document the physical muster formation - or PAI. This is done fourteen days prior to the unit moving to a different duty station.